Tech giant will take over a building at Piccadilly Circus. Google is encouraging Londoners to "unlock their curiosity" as it promotes its latest phone, the Pixel 3. 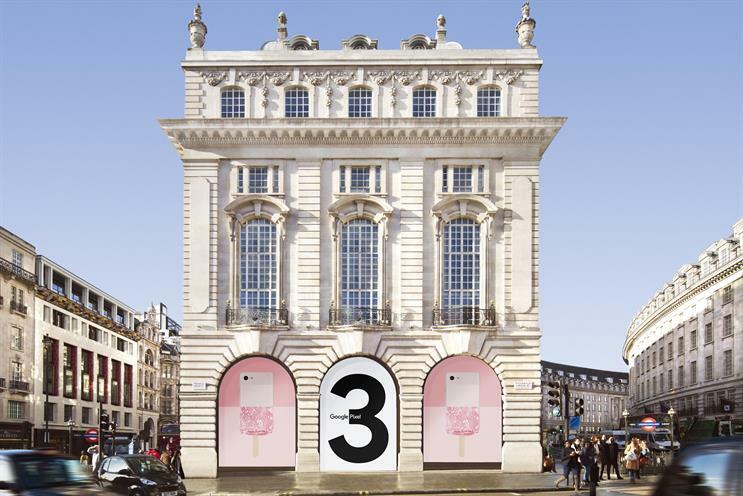 The tech giant is hosting a five-week experience set in a building at Piccadilly Circus, London, next month, where guests will be able to learn about the different features of the phone. On the ground floor, Google will show users how they can use Pixel 3’s latest Google Lens technology to "search what they see" and shop directly from the viewfinder. There will be a chance to take selfies using the phone's portrait mode. Visitors can then go down the "not pink" slide, where they will be encouraged to use the Pixel 3's Top Shot feature. On the first floor, Google will host talks on fashion, food, music and creativity. There will also be pop-up London stores, including a coffee bar that will change every week. Meanwhile, the basement will host weekly podcast recordings, one-off YouTube music events and dining experiences. The activation runs from 15 November until 16 December. It has been created by Amplify and 72andSunny.